Audiences might have missed the most memorable moment of the first “Insidious” film on their initial viewing: a short scene when mother Renai Lambert (Rose Byrne) walks through her house to take out the trash. From outside, she sees a ghostly paperboy dancing in front of her record player to the wailing falsetto of Tiny Tim’s “Tiptoe Through the Tulips,” yet the room is quiet and empty when she returns. But the creepiest part of this sequence happens during the tracking shot of Renai walking through her house—in the corner of the laundry room is the boy, standing motionless and facing the wall as she and the audience pass by obliviously. It’s precisely this level of detail from veteran horror director James Wan that allows “Insidious: Chapter 2” to succeed. More a continuation of the first film than a distinct sequel, “Chapter 2” reunites Wan with writer Leigh Whannell, with whom he previously collaborated on “Saw” and “Dead Silence.” This film resolves many unanswered questions and triumphs visually with its thematic use of color. The focus on tight writing and visual artistry is such that when “Chapter 2” does appear to stumble, it seems almost intentional. The story resumes immediately after the first film’s twist ending, assuming that the viewer is very familiar with the “Insidious” universe. For the uninitiated, the first film focuses on father Josh Lambert (Patrick Wilson), who possesses the ability of astral projection, which allows him to insert himself into “The Further,” a nebulous otherworldly limbo of malicious spirits. Josh’s son Dalton (Ty Simpkins) has an identical ability that causes the family to be plagued by parasitic spirits seeking to possess the boy, so Josh’s mother Lorraine (Barbara Hershey) and the rest of the family seek out a psychic named Elise (Lin Shaye). “Chapter 2” falters most during its beginning, when Wan wavers between launching straight into sequel mode and providing a classic horror setup. The family—now at grandma Lorraine’s house—takes a frustrating ten minutes of screen time to realize (again) that strange sounds and events are supernatural when it should be immediately obvious. Wilson delivers a delightfully crazy performance as Josh, now struggling with possession à la Dr. Jekyll and Mr. Hyde. Though at some moments (especially one involving a baseball bat) his acting seems farcically exaggerated, such a decision appears more of a deliberate choice on Wan’s part for comedic relief. Bolstered by strong writing, Whannell and Angus Sampson very effectively serve as the film’s main comedic relief, diffusing tension as a ghost-busting duo with their strong rapport and cleverly written dialogue instead of relying on physical comedy. It’s also very refreshing to see Byrne and Barbara Hershey deliver moving performances as strong female characters who lead the charge to protect their family. Perhaps the film’s greatest triumph is its intense devotion to color. The first film’s distinct olive green and gray palette reappears when grandma’s house is being haunted, while sparse use of the color red foreshadows confrontations with malevolent spirits. An effective inversion of the purity associated with the color white also helps establish some of the film’s most disturbing scenes, which revolve around not spirits but a room filled with the victims of a disturbed serial killer. Color, along with a screeching score composed by Joseph Bishara (who also scored the original), serve to establish atmosphere, which is crucial to Wan’s concept of horror. 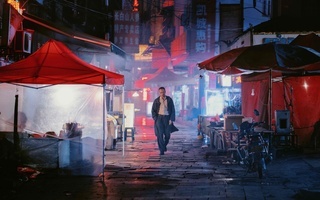 Bishara’s dissonant strings excellently complement the film’s dark settings, which allow Wan to focus on the development of tension instead of resorting to cheap scares. Every encounter in “Chapter 2” is not about whether a spirit will appear, but rather when and how. Wan has also mastered the fake-out scare, and he effectively manipulates tension to startle the audience during some of the calmest moments of the film. It’s easy to write off “Insidious: Chapter Two” as an unconventional film that fails to live up to certain horror standards—it makes regular use of comedy and rarely turns to thoughtless shock. But such an assessment ignores the film’s innovations and distinct atmosphere, qualities that place it among the few transcendent films that will shape and permanently change the future and conventions of the horror genre.